find value in their stories. become confident and proficient storytellers. realize their creative potential—on and off the page. The program empowers K-12 students to write a novel in 30 days. In 2017, more than 100,000 students and educators from over 9,000 classrooms around the world participated. The Young Writers Program has been covered by outlets including The New York Times, NPR, Edutopia, Education Week, and School Library Journal. The work of our students and educators is also often featured in local newspapers. Depending on the scope of your piece, you can find background information below, or get in touch to arrange an interview. Learn more about our program and impact. View our 2018 press release. Email us to talk more. "A thoughtful adaptation of the famous and fun grown-up novel writing contest, NaNoWriMo Young Writers Program is brimming with advice and encouragement as well as classroom support." 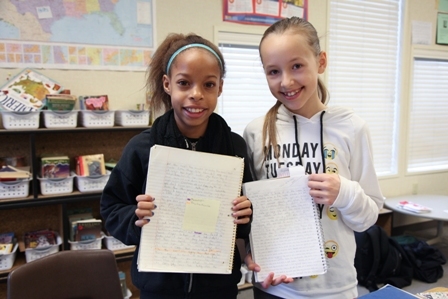 "My classmates and I wrote novels in our English class for National Novel Writing Month. Through this program, which had my entire class intrigued, we learned how to develop a plot, build character descriptions and foreshadow through writing our novels. It felt like we, the students, were in control, even though we were being guided by our teacher." "Room for Debate: A Passion for Learning is Hard to Quantify"
"To the students who participate, it is life changing... Two of our authors have gone on to self-publish their novels, and we have added their titles to our collection." "Rev up for National Novel Writing Month"
"It made me think that a lot of things could be possible in the world. I mean I am thirteen years old and I just wrote my own dang novel! How cool is that?" "The NaNoWriMo Project: The Birth of Student Novelists"